Home > Synchronous Belts > One Sided Timing Belts (Single Side Synchronous Belts) > HTD Timing Belts. Round (Curvilinear) Tooth Profile > 177-3M-04 HTD Timing belt. 3M-177 x 4mm Wide. 177-3M-04 HTD Timing belt. 3M-177 x 4mm Wide. 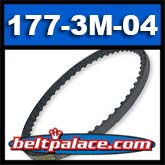 177-3M-04 HTD Timing belt. 3M Pitch-177mm Length x 4mm Wide. Sears item # SPM11142782415, Gates # 177-3m-05 (only 1mm width difference). Bissell "BR-1075 BELT, PROHEAT EXTRACTOR GEARED" 177-3M. Vacuum parts: BR-1075 Geared Brushroll Belt. Shark NH130 Belt (NH130 Vacuum Cleaner Belt). Bissell PROheat 2X Multi-Surface Pet Upright Carpet Cleaner 8930U Replacement Belt.